And so, he who is the primal Fountain of life, full in himself and filled with himself, gushed forth in the secret places of the heavens about Him, to fill them all with His favors. And having endowed the remotest heights and recesses, He burst upon our earth, saving men and beasts, multiplying His mercies everywhere. When He had first filled up the secret places, His teeming mercies billowed over; they poured upon the earth and drenched it, to multiply its riches. You must imitate the process. First be filled, then control the outpouring. The charity that is benign and prudent does not flow outwards until it abounds within. 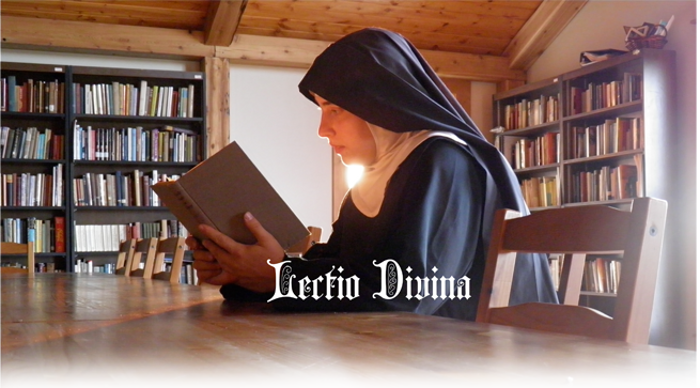 One ancient aspect of monastic life, imperative for proper growth in receiving the love and grace of Our Lord, is Lectio Divina: the reflective reading and re-reading of Sacred Scripture in silence, holy leisure and openness to the Word of God. "Would you enter into the very heart of God? Listen to His words,"
Lectio Divina is an essential part of the monastic day, as it is the nourishment of prayer. Better still, as we are the vessels in Our Lady's hands, waiting to receive the Mercy and Grace flowing from Christ's wounded side and to be poured out for priests, Lectio is prime "filling time." "Open thy mouth wide and I will fill it," the Bridegroom tells us through Scripture (Psalm 80:11). The prayer which sanctifies the rest of our day is anchored in and flows from these periods of prayer and prayerful study. Other conferences and classes in spirituality, philosophy, and theology provide a solid foundation for the mind and heart.